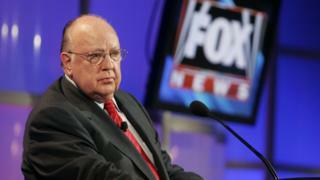 The US news network Fox News has dropped its slogan "fair and balanced". An executive told the BBC the decision had "nothing to do with programming or editorial decisions". Last August, producers were asked to use the slogan "Most watched, most trusted" instead, but there has been no official announcement of the change. Gabriel Sherman, the journalist who broke the story, tweeted that the slogan had been an "iconic tagline of the Roger Ailes era". A Fox News spokesperson told the BBC the network had not used "fair and balanced" in external marketing or on-air promotions since August 2016. The network is arguably the most powerful voice in US conservative media. What is going on at Fox News, and could it affect Sky bid?